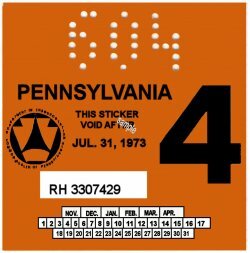 1973-4 Pennsylvania INSPECTION Sticker - $25.00 : Bob Hoyts Classic Inspection Stickers, Add a Final Touch to your Restoration! This 1973-4 Inspection sticker was issued from November, 1972 to May 1973 and expired July 31st, 1973. It has been digitally restored and reproduced exactly as the original both front and back. It has our patented "Peel and Stck" format that peels and sticks to the inside of your windshield.